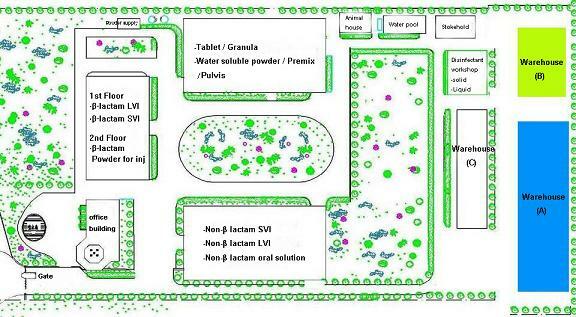 The company has special workshop building exclusively for the β-Lactam production which is completely separated from non β-lactam production. Different working plant has its own independent air handling unit. Clean classes in working plant are divided into 300,000 clean class, 100,000 clean class, 10,000 clean class, and 100 clean class respectively. There are 2 Water Plants in the facility to supply qualified water to various points for use after treatment. The products range from Injectable Solution, Powder for Injection, Oral Solutions, Tablets & Granules, Bolus, Pulvis, Premix as well as Liquid Disinfectant and Solid Disinfectant. There are more than 200 items in total. Production capacity of Water For Injection is 50 million ml per day ranking first in China, and 300,000 vials per day for Powder For injection, mainly Penicillin Potssium injection, 2 million tablets per day for Solid Dosage Forms, while 3 - 5 tons per day for Premix and Water Soluble Powder.